The venerable Louisville club follows Hillerich & Bradsby, makers of the famed “Louisville Slugger” baseball bat, and Churchill Downs as the only entities to be selected into the Kentucky Athletic Hall of Fame. Valhalla Golf Club, home to some of the game’s most dramatic major championships and the site of the last victorious United States Ryder Cup Team, has been selected to a rare berth in the Kentucky Athletic Hall of Fame. Valhalla follows Hillerich & Bradsby, makers of the famed “Louisville Slugger” baseball bat (2006) and Churchill Downs (2012) as the only entities to be selected into the Kentucky Athletic Hall of Fame. Valhalla is part of a seven-member class that will be inducted June 18, in a ceremony at the Crowne Plaza in Louisville. The other 2014 honorees are sportscaster Paul Rogers, triathlete Susan Bradley-Cox, basketball coach Stan Hardin, boxer Rudell Stitch, baseball coach Bill Miller and horse trainer/breeder Charles “Redd” Crabtree. 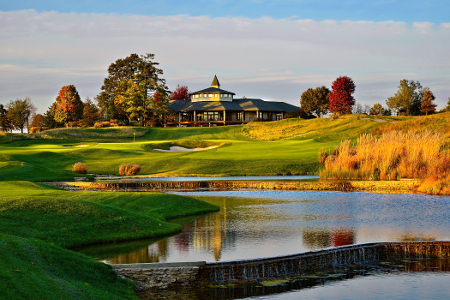 Opened in 1986 and designed by legend Jack Nicklaus, Valhalla Golf Club is listed by Golf Digest as one of “America’s 100 Greatest Courses.” It was the site of the 1996 and 2000 PGA Championship, and will host the 96th PGA Championship, Aug. 5–10. All net proceeds from the Kentucky Athletic Hall of Fame luncheon and ceremony benefit Kosair Charities. To purchase tickets, visit www.kyathletichalloffame.org.